Salt, also known as rock salt, is a crystalline(it refers to the degree of structural order in a solid) mineral that is composed primarily of sodium chloride (NaCl), a chemical compound belonging to the larger class of ionic salts. It is essential for animal life in small quantities, but is harmful to animals and plants in excess. Salt is one of the oldest, most ubiquitous food seasonings and salting is an important method of food preservation. The taste of salt (saltiness) is one of the basic human tastes. Chloride and sodium ions, the two major components of salt, are needed by all known living creatures in small quantities. Salt is involved in regulating the water content (fluid balance) of the body. The sodium ion itself is used for electrical signaling in the nervous system. Because of its importance to survival, salt has often been considered a valuable commodity during human history. 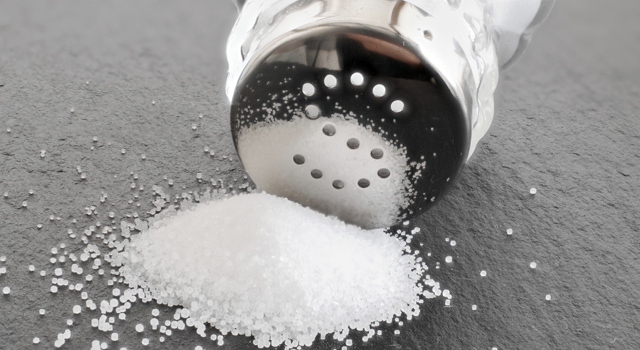 However, as salt consumption has increased during modern times, scientists have become aware of the health risks associated with high salt intake, including high blood pressure in sensitive individuals. Therefore, some health authorities have recommended limitations of dietary sodium, although others state the risk is minimal for typical western diets. Some types of salt have risen to gourmet status, along with a corresponding price tag. Processing methods and location of origin figure into pricing. Certain types of salt are better for some cooking or preserving methods. Coarse salt: Coarse refers to the grind. The jagged edges and large crystals make this a good choice for sprinkling on pretzels or corn on the cob because the edges tend to cling and the salt does not readily melt. Fine salt: This is the common salt normally found on every table. It is a fine-ground, refined rock salt with some additives to keep it free-flowing. Iodized salt: Salt which has iodine (sodium iodide) added. Iodine is a mineral necessary to the body to prevent hypothyroidism and some countries actually require iodine added by law. For those who live in areas away from oceans, iodized salt is an easy way to get this necessary nutrient into the diet. Surprisingly, iodized salt contains a small amount of sugar (usually indicated as dextrose in the ingredients listing), without which the salt would turn yellow due to oxidation of the iodine. Industrial salt: This fine-grained salt has no additives and is generally used in brines to pickle foods. Unlike table salt, the lack of additives will help keep the pickling liquid from clouding.